I was wrong. I will admit. I held out for so many years. Turned my nose up. Said I had no interest. I am absolutely obsessed with my new Kindle. I LOVE the convenience of it. I love that I can take it anywhere. I love that with one little touch of a button, I can have a book right in my hands. No more waiting to go to the store. Just click and start reading. I've had the Kindle for 2 weeks and I have read 4 books and I'm on my 5th. I am truly obsessed! and while I love it, I wish I would have gotten either the touch or the one with the little keyboard. It really isn't THAT big of a deal but I would have gone up a step. Other than that, the only other major complaint (and the main one I had with even getting the Kindle) is that you can't share books. Yes, there is an option on SOME books if you are a member of Prime Club that you can share a book 1 time but, for the most part, there is no sharing. That really is the only bad thing that I have found about it. Also, another complaint I have is that there is no backlighting so if you want to read in bed you have to have a reading light or turn on a lamp which isn't always greatly accepted by the hubs. 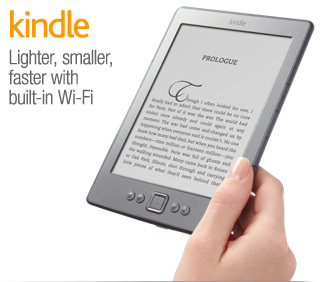 I finally got smart, though, and downloaded the Kindle iPad app. Since the iPad has backlighting, I can now lay in bed and read at night without disturbing anyone. It is fantastic. I do miss the turning of the pages and the smell and feel of a real book but not enough to ever go back. At this rate, reaching my goal of reading 50 books will be no problem!